Week 24 of the AHL’s schedule had Rockford playing back-to-back games against the Abbotsford Heat in British Columbia. These two teams are a part of the AHL’s insane fight for the final playoff spot in the Western Conference, and that fight got even crazier once the weekend was over. On Friday, March 22nd, the Hogs and Heat faced off for the first time since February 16th. The Hogs took the decision 5-2. Brandon Svendsen, Martin St. Pierre, Steve Montador, Brad Mills and Rostislav Olesz got on the board for the visitors. Montator’s goal was his first in an IceHogs sweater and came on the power play. Mills’ goal was his third of the season and was a shorthanded penalty shot conversion. Olesz was back in game action for the first time since April 1, 2012. Henrik Karlsson made 33 saves for Rockford in their victory. The following night, the Hogs were back at it again against the Heat. They were able to rally from behind and salvage a point in overtime, but dropped the contest 4-3. 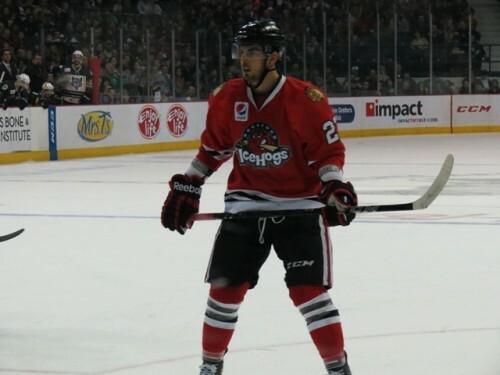 Brandon Pirri started Rockford’s comeback in the third period as the Hogs were down 2-0. Ben Smith tied it up less than four minutes later. After giving up another goal to Abbotsford, Rostislav Olesz tallied with ten seconds left in regulation—and while the Hogs were on a power play—to send it to overtime. Henrik Karlsson was in net again for Rockford and made 21 saves in their overtime loss. –Rostislav Olesz looked like he hadn’t missed any time at all when he returned back into the line-up. He fit in seamlessly and helped the Hogs with their offense. He racked up 3 points (2G, 1A) in his first two games back. -The IceHogs had four players suspended for Friday night’s game: Jeremy Morin, Wade Brookbank, Shawn Lalonde and Kenndal McArdle. The first three were suspended due to their actions in the at-the-bench-brawl on March 17th against the Chicago Wolves. -IceHogs forward Mathieu Beaudoin registered his 150th AHL point with his primary assist on Brandon Svendsen’s first period tally on Friday night. –Brad Mills’ penalty shot goal on Friday night was the first penalty shot conversion for Rockford this season; it was the team’s fifth penalty shot this year. In Rockford’s AHL era, there have only been three goals on 18 attempts. -IceHogs captain Martin St. Pierre became the IceHogs’ AHL era leader for power play assists. The power play helper that put him over the edge came on Steve Montador’s second period power play tally on Friday. –Ben Smith and Brandon Pirri both played in their 150th AHL game on Saturday night. Pirri also registered his 100th pro assist on Smith’s third period goal on Saturday. -The IceHogs have the No. 1 ranked power play in the AHL (22.1%). At home, the Hogs are third on the pp (21.0%) and they are ranked second on the road (23.3%). -The IceHogs are ranked 15th on the penalty kill (83.2%). At home, they are 23rd (81.0%) and on the road they are ranked 5th (85.7%). 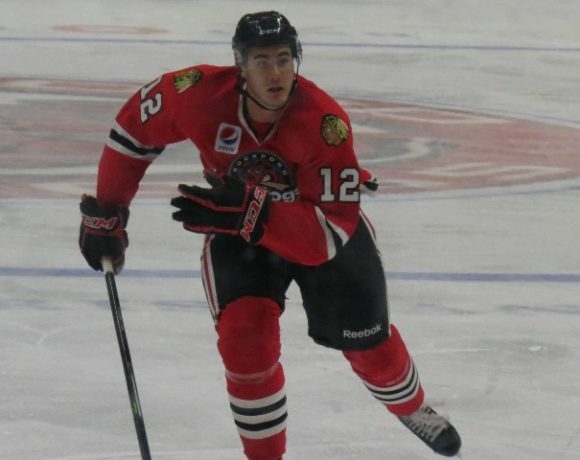 -Take a listen to IceHogs forward Terry Broadhurst on the Stone and Double T show on WXRX in Rockford from Tuesday morning. -The IceHogs’ record is now 33-28-2-1 (69 points). They’re in a four way tie for 8th place in the Western Conference standings with the Chicago Wolves (who they are tied with for 3rd in the Midwest Division), the Oklahoma City Barons and the Abbotsford Heat. The Hogs are slotted in 10th since the Wolves and Barons have 2 games in-hand on Rockford and the Hogs have 3 games in-hand on the Heat. 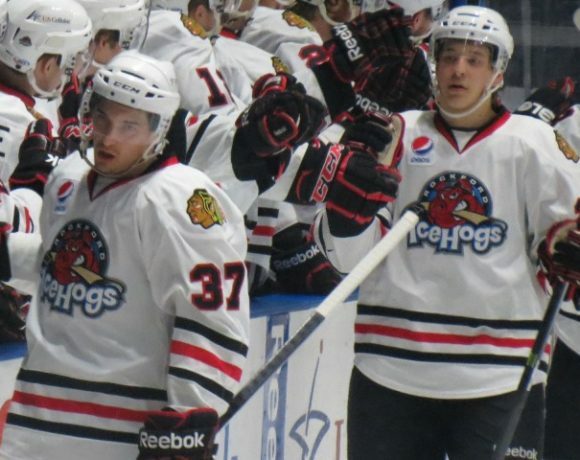 -IceHogs forward Rob Flick turns 22 on Thursday. Happy birthday, Rob! The IceHogs have a four game homestand coming up and each game means a lot for them in regards to their playoff push. They need to take at least 6 out of 8 points in these next four games, but taking 7 or 8 out of 8 is the goal. Want to follow these games, but can’t be at the BMO Harris Bank Center, watch on T.V. or AHL Live, or listen to them? Follow me at @kimwrona7 on Twitter. I’ll be live-tweeting them. /Shameless plug. Wednesday, March 27 vs. Toronto at 7:05 p.m.
-The Marlies lead the North Division with a record of 36-20-2-6 (80 points) and are second in the Western Conference. They’re wrapping up their recent tour of the Midwest with Rockford today. In their last games, they are 2-0-0-2. They’re coming off of a 3-2 shootout loss to the Peoria Rivermen on Sunday. 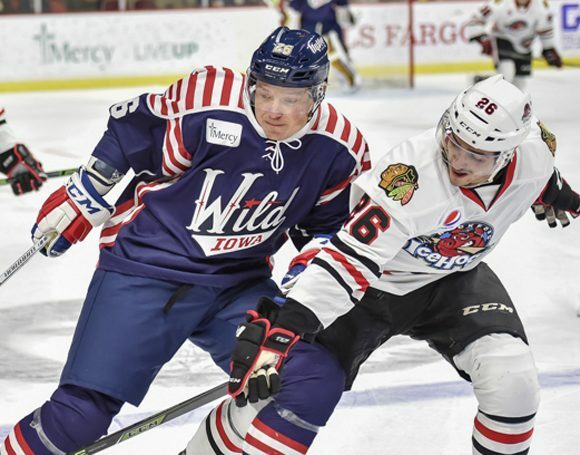 Friday, March 29 vs. Milwaukee at 7:05 p.m.
-The IceHogs are going to see a whole lot of the Admirals in these last final weeks of the AHL season. The Admirals currently have a record of 32-24-4-3 (71 points) and are 7th in the Western Conference and 2nd in the Midwest Division; they have 1 game in-hand on the Hogs. In their last 4 games, the Ads are 3-0-1-0. They’re going to be a tough test for Rockford. Saturday, March 30 vs. Oklahoma City at 7:05 p.m.
-Saturday is the last time the Hogs will play the Barons in the 2012-13 regular season. The Barons hold a record of 30-23-2-7 (69 points) and are part of the four way tie for 8th in the Western Conference and are 4th in the South Division; they have 2 games in-hand on Rockford. In OKC’s last four games, they are 2-1-0-1. Tuesday, April 2 vs. Milwaukee at 7:05 p.m.